Find us… in the heart of Ambleside. You will see the Adventure Peaks shop, Café Altitude and Ambleside Climbing Wall on the right just as you leave the centre of Ambleside. There is a large public car park next to our building. Follow the one-way system heading south towards Windermere and Waterhead. 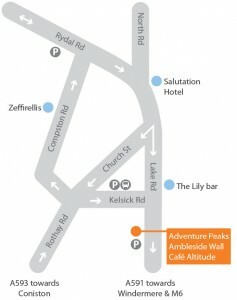 You will see the Adventure Peaks shop, cafe and climbing wall on the right just as you leave the centre of Ambleside. There is a large public car park next to The Ambleside Climbing Wall. We are open every day except Christmas Day. Call us on 015394 33794 or visit us in Ambleside.